The overlap between Zone of Pain and F-buddy should be called “Black-out drunk”. Also I hate the zone of pain. JC you make a great point. I’ve been banging null for a while now and she has great asymptotes (OH MATH SNAP!). I think this should be redrawn from a true male’s perspective. 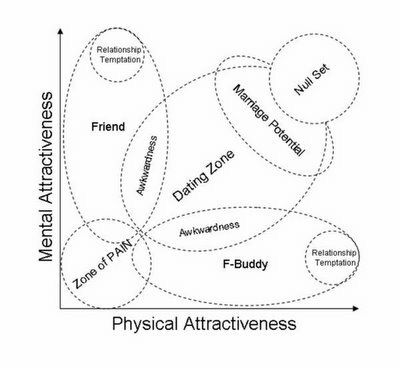 That is, the “relationship temptation” circle that is enclosed by the friend ellipse should be excluded. There is no such circle. It seems the Y component could actually be any attractiveness variable other than Physical–monetary, social, e.g.